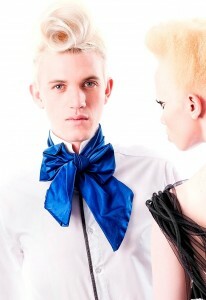 Gert-Johan Coetzee’s latest collection is inspired by a sea urchin and the key piece which will be revealed this weekend at SA Fashion Week. These delicate, graceful sea creatures would be defenceless if it weren’t for their sharp spines… and that image of defence came to mind when Coetzee was conceptualising his new collection. “There has been so much violence against women in the news this year already, and I wish we could eradicate that. GJC is all about making women look and feel beautiful, and I started thinking imagine clothes could become armour to protect defenceless women,” says Coetzee. “That is why I decided to dedicate my Spring/Summer 2013 collection to women who face violence, and why I approached Shout, whose message that we should stand up and not be silent really resonates with me,’ explains the designer. In designing the elements needed to bring the image in his mind to life, Coetzee, always looking for the cutting edge, collaborated with the Vaal University of Technology to bring the latest in high technology to the catwalk. Three-dimensional printing is a miraculous-seeming technology that creates previously impossible geometries in single pieces, limited only by the designer’s imagination. The face of Coetzee’s last collection, Thando Hopa, is also involved this time around, and thrilled by the involvement with Shout. ‘Gert has shown what he can do in raising awareness of albinism, so I know this initiative will be just as powerful,” says the young prosecutor who has redefined perceptions of albinism since she was given a platform by Coetzee last year.